There are thousands of books about marijuana – – more than enough to celebrate National Read Across America Day on March 2nd. As marijuana continues to gain notoriety and respect as more than just being for recreational use – – but also as legitimate medicine – – marijuana-related books are continue to hit the shelves all the time. Ranging from practical beginner guides to in-depth textbooks, and everything in between, there are books about marijuana that cover every subject you can think of. But, like most things, not all books are the same. The quality and level of research vary significantly from title to title, and author to author. Unfortunately, this can make it rather difficult for consumers find the information they’re looking for. But, we here at World of Weed are here to help. Here are 10 must-read books about marijuana, just in time for National Read Across America Day. Just prior to the historic 2012 marijuana legalization here in Washington, these policy experts gave the cannabis community basic, easy-to-understand answers to 150 of the most common questions people have about marijuana and its legalization. This book provides the reader with a comprehensive overview of alternative ways marijuana legalization could be designed and implemented, marijuana taxation, and restrictions on marijuana advertising. This book clearly lays out and explains the major issues surrounding marijuana and legalization. This book may be on the smaller size, but it’s a giant wealth of information. Elliott goes in-depth into the cultural and historical importance of cannabis before going into the plant’s myriad medical uses. Additionally, this book serves as a sort of cannabis index, referring the reader to dozens of external resources – – such as documents, articles, recipes, etc.) – – and encourages the reader to check them out as a means of supplementing their learning. The Little Black Book of Marijuana is one of the best books about marijuana out there, and definite proof that even the smallest things can be the greatest gift. No list of must-read books about marijuana would ever be complete without The Cannabis Manifesto! One of the most well-known books in the cannabis industry, this is a vital title for anyone interested in medical marijuana. Author Steve DeAngelo is the founder of the world’s largest medical marijuana dispensary, making him the go-to expert for all your most pressing marijuana questions. Taking from years of extensive research and vast knowledge, DeAngelo takes the reader on an engaging journey into the world of medical marijuana, taking a look at its physical and mental effects, it’s spiritual effects, and how its changing the landscape of modern medicine and health. Usually, an account of drug-testing labs would likely put the average reader to sleep. Heart of Dankness, on the other hand, offers an alternative, parallel pharmaceutical industry exclusively consisting of artisanal cannabis farmers, botanists, and connoisseurs. As a journalist reporting for the Los Angele Times, and armed with a medical marijuana recommendation, Haskell Smith makes his way to Amsterdam to attend the annual High Times Cannabis Cup. Educational insight, paired up with infectious humor, gives the reader a different look at the scientific aspect of an industry that is typically shrouded in stigma. Humans have been using and consuming marijuana in numerous ways since around 500 B.C., and we’re still using it today. Having a firm understanding of the history of the plant that took the world by storm and has only continued to grow in popularity – – for millennia! – – is a great thing to have, and Booth offers you exactly that. Cannabis: A History takes a close look at marijuana, its popularity, it’s legalization, the “green rush”, and where it all started. This novel is set in remote marijuana country, and follows five marijuana-growing combat veterans named Shadow, Shrimp, Stones, Toon, and Shakespeare. While each of these veteran growers has his own dreams of how to spend their money, they’re all put on hold when rival growers show up in town. Things are about to get real. Written by an expert outdoorsman who loves living off the grid and goes by a pseudonym, this handbook is an invaluable growing guide for those who are curious about growing marijuana and want to learn the science behind marijuana cultivation. Edibles are potent, discreet, and delicious. They’re great! The only thing better are edibles you made or baked yourself. And, to make edibles, you need some tasty ideas. Sure, you could always just go for a pot brownie or a weed cake. But, everyone does those. They’re soooo overdone. But, what if you could create the dankest, most mouth-watering, delicious marijuana edibles your friends have ever had? That YOU have ever had? That’s where The Official High Times Cannabis Cookbook comes in. If you’ve been around weed at all, for any length of time, you’ve undoubtedly heard about High Times. They’re THE resource on all things marijuana, being a trusted and super well-known cannabis lifestyle magazine. And, like everything else High Times does, this cookbook is flatout DANK. Just like the edibles it will teach you to make. When most people think about marijuana edibles, they tend to think about things like candy or brownies. But, edibles are definitely not just limited to food. In fact, we’ve got cannabis-infused beverages here at World of Weed, including soda and lemonade! This book is on the list of must-read books about marijuana for a reason – – it’s a definite must-read! This takes a look at the different types of cannabis-infused drinks (both with and without alcohol) you can make on your own, along with some tips on how to make your drinks even BETTER. How? By adding THC! This book has 75 recipes to help you get as lifted as your heart desires. Bonus? You learn valuable stoner skills, like decarbing your weed. This 1984 novel follows the misadventure of Felix Nasmyth, the protagonist who has the brilliant idea to get rich quick by growing marijuana. Illegally. Felix Nasmyth is a young man who has always been one to quit projects before he’s finished them. He gives up on things and has “always been a quitter.” With a bleak future ahead of him, Nasmyth feels he doesn’t have much to lose and gets talked into participating in a “summer camp” – – a secluded, rural spot out in Mendocino County, California – – to grow large amounts of marijuana. As with most illegal operations, this venture seems doomed from the very beginning, but Nasmyth is determined to break his cycle of being a quitter. In the end, things fall through. During all of this, Nasmyth has fallen in love with a lovely woman, ending the novel on a high note. Even with the optimism, this book does contain themes of substance abuse, the war on drugs, male camaraderie, and capitalism. Time to Read Some Books About Marijuana! There’s no doubt about it: Knowledge is power. By reading these books about marijuana, you’ll have a better understanding of how marijuana works, the history of marijuana and its legalization, and how you might benefit from its consumption. We’ve got a whole library of educational blog posts available here on the site, but these books will help pad your knowledge bank. Follow us on Twitter for daily deals and specials! 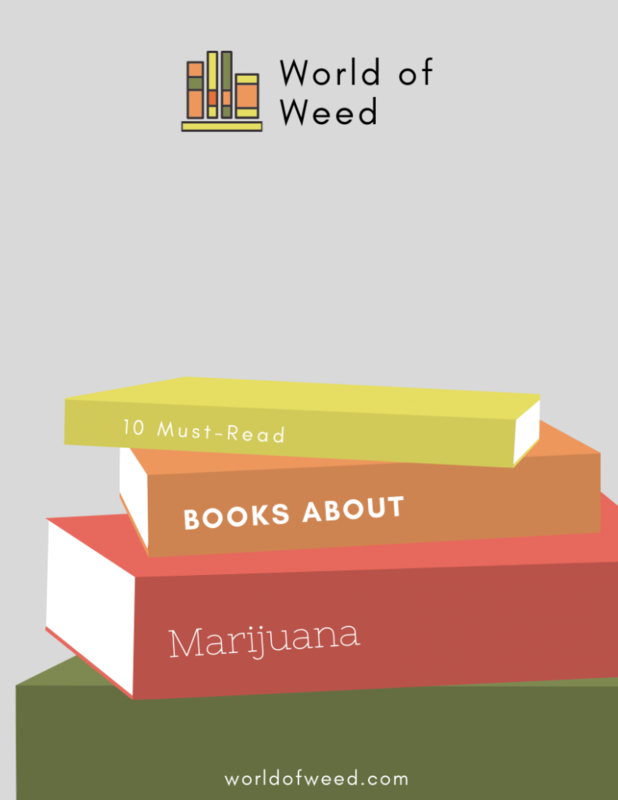 The post 10 Must-Read Books About Marijuana appeared first on World Of Weed.